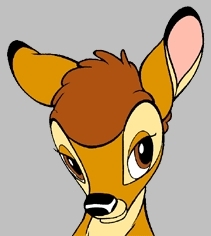 who else was sad when bambi's mom got shot? and do te think it was an accident? Does thumper o fiore fart in any movie? I want to laught at something. One of the oddest things about Bambi's legacy is the film's lack of presence in the Disney theme parks. Everything te read about Bambi cites it as one of Walt Disney's greatest achievements; the unseen Man is one of the greatest Disney villains; Bambi is one of Disney's most iconic figures and yet Bambi, and his forest friends, are practically invisible as far as the theme parks are concerned. A Disney Tale: A deer, Bambi, is born in the forest, the heir to the Prince of the Forest. He meets a rabbit, Thumper, and a skunk called fiore and they live through the seasons of the forest learning about life and Amore until Bambi becomes the Prince himself, protector of the forest. bambi:yeah i Amore living here it's so peaceful so quiet..
oscar:no mo' like a liberty campana, bell if te ask me. a poll è stato aggiunto: do te like the great prince?